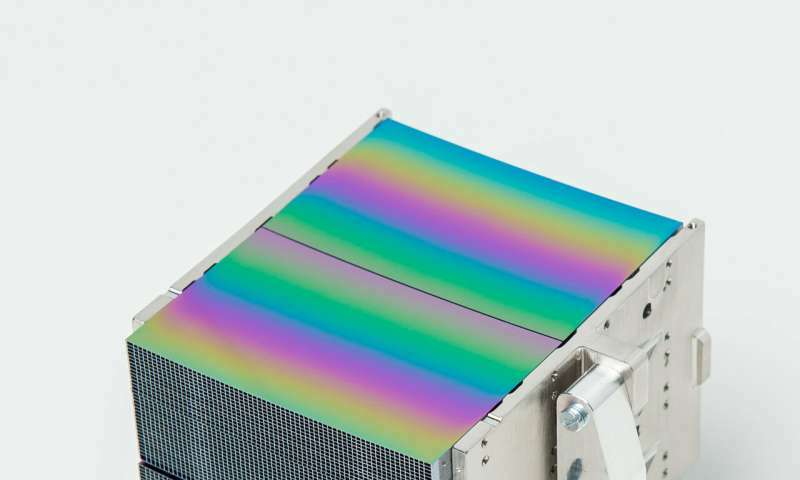 This 'mirror module' – formed of 140 industrial silicon mirror plates, stacked together by a sophisticated robotic system – is destined to form part of the optical system of ESA's Athena X-ray observatory. Energetic X-rays don't behave like typical light waves: they don't reflect in a standard mirror. Instead they can only be reflected at shallow angles, like stones skimming along water. So multiple mirrors must be stacked together to focus them: ESA's 1999-launched XMM-Newton has three sets of 58 gold-plated nickel mirrors, each nestled inside one another. But to see further, Athena needs tens of thousands of densely-packed mirror plates. A new technology had to be invented: 'silicon pore optics', based on stacking together mirror plates made from industrial silicon wafers, which are normally used to manufacture silicon chips. It was developed at ESA's ESTEC technical centre in the Netherlands, and patented by ESA, invented by an ESA staff member with the founder of cosine Research, the Dutch company leading an European consortium developing Athena's optics. The technology was refined through a series of ESA R&D projects, and all process steps have been demonstrated to be suitable for industrial production. The wafers have grooves cut into them, leaving stiffening ribs to form the 'pores' the X-rays will pass through. They are given a slight curvature, tapering towards a desired point so the complete flight mirror can focus X-ray images. "We've produced hundreds of stacks using a trio of automated stacking robot," explains ESA optics engineer Eric Wille. "Stacking the mirror plates is a crucial step, taking place in a cleanroom environment to avoid any dust contamination, targeting thousandth of a millimetre scale precision. Our angular resolution is continuously improving." "Ongoing shock and other environmental testing ensures the modules will meet Athena's requirements, and the modules are regularly tested using different X-ray facilities." Athena's flight mirror – comprising hundreds of these mirror modules – is due for completion three to four years before launch, to allow for its testing and integration. Each new ESA Science mission observes the Universe in a different way from the one before it, requiring a steady stream of new technologies years in advance of launch. That's where ESA's research and development activities come in, to early anticipate such needs, to make sure the right technology is available at the right time for missions to come.